Premium desktop replacement. The Asus N751JX lends oneself as a replacement for the home desktop PC. Overall, it performs well. However, with a price tag of about 1200 Euros (~$1351), it is not a bargain. With the Asus N751JX-T4056H, we have a new model from Asus' 17.3-inch premium series to review. We have already reviewed the N751JK-T4144H model of this series. Our current test model is an update with a slightly faster processor and the new GeForce GTX 950M graphics card. Primarily, computers like the Toshiba Satellite P70-B or the HP Envy 17 would be the competitors. However, models like the Acer Aspire VN7-791G and the Lenovo Y70 are also included, although, the latter are aimed at gamers. Since the two N751 models we have reviewed have the same design, we will not cover case, connectivity, input devices, display and speakers here. Please refer to our Asus N751JK-T4144H review for information about these. The N751JX comes with the same matte, bright Full HD display as its sibling. Nevertheless, the measured values are not exactly the same. This is normal, since two identical panels are never exactly the same. 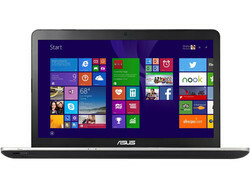 The N751JX is one of the premium all-round notebooks from Asus. The processing performance is sufficient for all usual application scenarios. In addition, the computer can run games. Our test model is priced at about 1200 Euros (~$1351). Asus also offers other configurations. With the Core i7-4720HQ quad core processor (Haswell), the N751JX houses one of the fastest mobile processors currently available from Intel. It delivers more than enough performance for all usual application scenarios. The CPU works at a base clock of 2.6 GHz. With Turbo, the clock can increase to 3.4 GHz (four cores), 3.5 GHz (two cores) or 3.6 GHz (single core). In both mains operation and on battery, the CPU runs at 3.3 to 3.6 GHz in single thread applications. Multithread applications are processed at 3.1 to 3.3 GHz in mains operation. Therefore, the processor falls short of its potential in Multithread applications. In battery mode, the CPU clock falls abruptly to 800 MHz repeatedly during Multithread applications. Applications optimized for multiple cores benefit from the quad core processor of the N751JX. However, the quad core processor performs only slightly better than the frugal ULV dual core processors like the Core i7-5500U in single thread performance, which is important for everyday tasks. The system performance is not surprising. The system works smoothly without any problems. The results of the PCMark benchmarks are very good. The Asus notebook cannot outperform ULV notebooks like the HP Envy 17. The powerful processor does not really bring advantages for everyday tasks. However, it is still possible to increase the system performance of the N751JX. In order to do so, the notebook has to be equipped with a solid-state disk. Positive: You do not need to remove the hard drive to do so. The computer features an M.2 slot (full size) for an SSD. Our test model comes with a hard drive from Toshiba with a capacity of 1 TB and a revolution speed of 5400 rpm. The hard drive is partitioned into a system partition (372 GB) and a data partition (542 GB). The transfer rates of the hard drive are normal for 5400-rpm hard drives. If you run out of storage space, you can upgrade the laptop in several ways. For example, an SSD could be connected to the M.2 slot (Full Size). In addition, there is also a second hard drive tray, where you could incorporate another 2.5-inch hard drive. Asus has equipped the N751JX with the GeForce GTX 950M graphics card, the successor of the GTX 850M core. The two GPUs are technically identical. 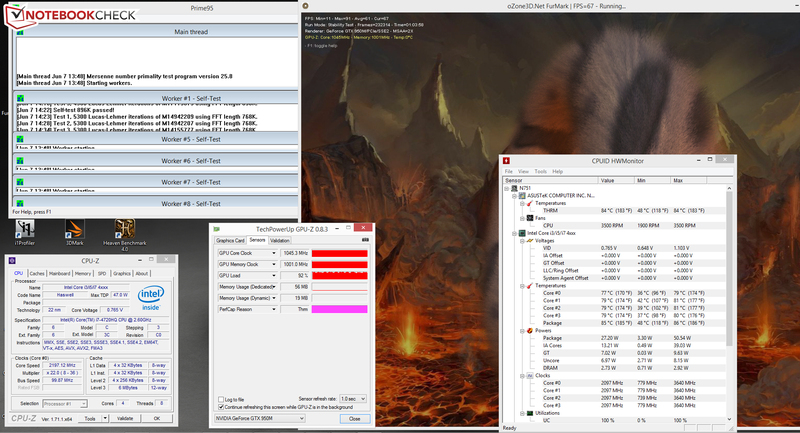 The GTX 950M core has just over 4% higher maximum clock (1084 MHz/1124 MHz). As a result, there is hardly any difference between the performance of GTX 950M and GTX 850M notebooks with comparable CPUs. This can be seen in practice: The results in the 3DMark benchmarks of the N751JX are only slightly better than those of the N751JK sibling with GTX 850M. Apart from the GeForce GPU, the notebook also features Intel's HD Graphics 4600 graphics core. The two GPUs are combined in a graphics switch solution. Intel's GPU is responsible for everyday tasks and on battery and Nvidia's graphics card is used for demanding applications like computer games. The graphics cards are switched automatically. The user does not need to intervene. Current computer games can be played with the combination of the CPU and GPU of the computer. Most games run in HD resolution (1366x768 pixels) with medium to high quality settings. The maximum resolution of the screen can only be used in a few games. As already mentioned, the GTX 950M only works at an almost 4% higher maximum clock than its predecessor. As a result, the frame rates are slightly higher at best. In practice, the results are not that clear. For example GTX 850M notebooks achieve significantly higher frame rates than the N751JX in the game “Dirt Rally”. We suspect that driver optimization is missing. There is no reason for owners of a GTX 850M notebook to replace it with a GTX 950M model - unless it also brings a CPU upgrade. If you are considering buying a GTX 950M model, you should also consider GTX 850M models as an alternative. You might save some money and the gaming performance is only slightly lower. 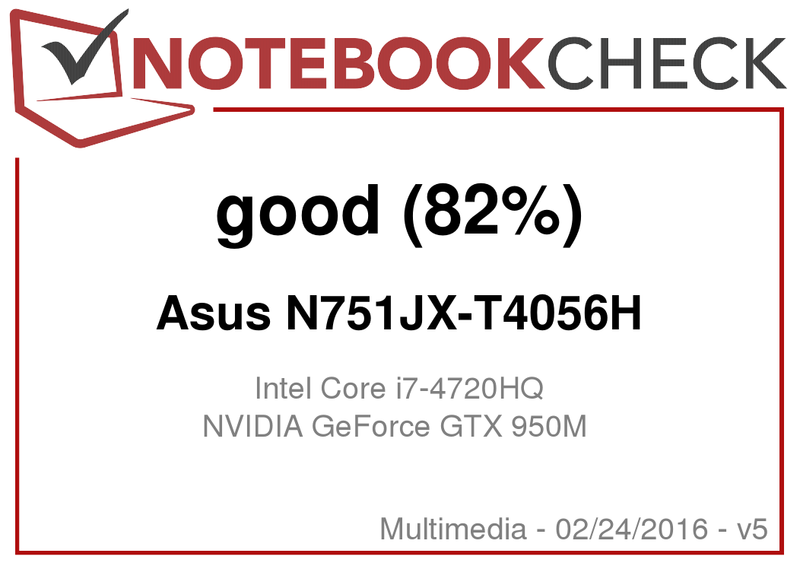 If you need more gaming performance, you should buy a different notebook. Notebooks with GeForce GTX 960M are recommended, - e.g. the Acer Aspire VN7-791G starting from 1200 Euros (~$1351) is not any more expensive. While idling, the fan works constantly at low speed. In addition, the noise of the hard drive is audible. Under load, the fan gets louder. During the stress test, we measured a noise level of 42.4 dB(A). Considering the performance of the hardware, this is a good value. The N751JX during the stress test. In our stress test (Prime95 and FurMark run for at least an hour), the processor starts with 2.5 GHz and the graphics card with 1124 MHz. Later on, the clock rates fall. The processors level off at around 1.9 to 2.2 GHz. The clock rate of the GPU decreases slowly and gradually. After about 45 minutes, it reaches 1045 MHz and remains there. In battery mode, the clock rates behave differently. The graphics core works at 135 MHz. The clock rate of the processor jumps back and forth between 800 MHz and 3.4 GHz. The N751JX does not get particularly warm during the stress test (Plugged in). Only two measurement segments exceed the 40 degrees Celsius (104 degrees Fahrenheit) mark. (±) The average temperature for the upper side under maximal load is 32.3 °C / 90 F, compared to the average of 30.9 °C / 88 F for the devices in the class Multimedia. (+) The maximum temperature on the upper side is 38.3 °C / 101 F, compared to the average of 36.5 °C / 98 F, ranging from 21.1 to 71 °C for the class Multimedia. (+) In idle usage, the average temperature for the upper side is 24 °C / 75 F, compared to the device average of 30.9 °C / 88 F.
(+) The palmrests and touchpad are reaching skin temperature as a maximum (32.2 °C / 90 F) and are therefore not hot. (-) The average temperature of the palmrest area of similar devices was 29.1 °C / 84.4 F (-3.1 °C / -5.6 F). The power consumption of the Asus computer is not surprising. While idling, we recorded a power consumption of up to 17.8 watts, which is usual for a notebook with this hardware. During the stress test, the energy demand increases to 92.3 watts. If the CPU used its Turbo, the value would clearly exceed the 100 watts mark. Reserves would be available: The power adapter is rated at 120 watts. Our realistic WLAN test automatically opens web sites at 40-second intervals. The profile "balanced" is selected and the display brightness is set to about 150 cd/m². The N751JX achieves a battery life of 4:04 h and falls behind its sibling (4:58 h). The Asus N751JX does not only want to attract gamers, but is also appropriate as a replacement for the home desktop computer. The computer delivers more than enough processing performance for everyday tasks and can run computer games smoothly. The noise and temperature remain moderate. Thanks to the 1 TB hard drive, users will not lack storage capacity. In case the hard drive is actually full one day, you can simply add a second 2.5-inch hard drive. In addition, there is also a slot for an M.2 SSD. A notebook designed as desktop replacement should also have good input devices. The computer does not disappoint in this respect. We also liked the matte, bright Full HD display. However, its contrast could be higher. Unfortunately, Asus has incorporated a TN panel with narrow viewing angles. An IPS display should actually be standard for computers in this price range. Fortunately, the built-in TN display is one of the better models of its kind. Its viewing angles are visibly wider than we are used to from TN models. To summarize: With the Asus N751X, you will get an all-round notebook/desktop replacement without any real weaknesses for just under 1200 Euros (~$1351).